Our PTFE Balls are perfectly used, where metals or alloys cannot be used. PTFE Plastic Balls are highly functional in self-lubrication conditions such as ball bearings. 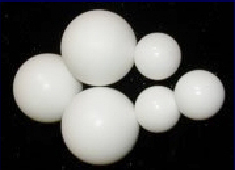 Today, we are counted among the key PTFE Balls Manufacturers and Suppliers in India. Solid PTFE Balls are available in size range of 6mm to 10mm or according to the specifications of our customers. The PTFE ball is a unique product. It has many advantages in applications where metals or alloys can not be used. These advantages are Broad operating temperature (-400oF to +500oF), Chemical inertness to most corrosive liquids or gases extremely low coefficient of friction. PTFE balls are highly functional in self lubricating conditions such as ball bearings. In the fluid handling industry PTFE balls are used in ball valves that have contact with extremely corrosive liquids. PTFE ball has reduced maintenance costs and man hours in the field by eliminating the replacement of valve components subjected to corrosive environments. Balls are available in size from 6mm to 150mm. But it can also be made in any specifications.